Three men were killed when their car plunged 200ft into a reservoir in the Teesta near Dikchu in North Sikkim last night. The bodies were recovered from the hatchback after an operation that continued for around 10 hours in two phases. The trio were returning home after visiting a market at Dikchu, 45km from here. The deceased are Deo Bir Limbo, 30, Bhakta Bahadhur Limbo, 30, and Sunil Limbo, 38. They were residents of Mangshila village in North Sikkim and used to do odd jobs. Police said Deo Bir was driving the car. An employee of the Border Roads Organisation saw the car falling into the river around 7pm yesterday and informed the police. 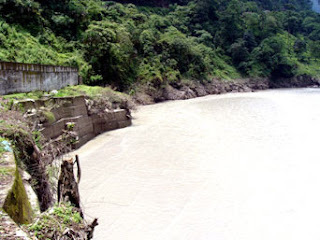 The North District superintendent of police, Shammi Rai, said the vehicle had submerged in the reservoir of NHPC stage IV after falling almost 200ft from the road. "It took almost 20 hours to recover bodies. We searched for the bodies till three in the morning, after which the operation was suspended because of heavy rainfall. The search resumed at 11am and the bodies were found in the car at 4pm," said the SP. Rai said the NHPC had discharged some water from the dam so that the search could be carried out properly. Divers from the Home Guards Rescue under the Sikkim police and those sent by private rafters at Kalimpong in neighbouring Bengal conducted the operation. The SP and district collector Karmpa Bonpo were at the spot this morning. The bodies were taken to North District hospital at Mangan for post-mortem.